Casey Wohl has launched a new book this Christmas. it is the 2nd book in her series of Girls Getaway Guide. This book is about the ins and outs of Key West. It is a comprehensive guide which lists down how to get to this small island, the places to stay, visit,shop, eat and just chill out. The 144 page book starts off with a brief history about the place and goes on to list the different types of accommodation available. There is a brief synopsis about each listing and the contact details to each establishment. There is also an annual calendar of events/festivals which states areas annual happenings to give the reader a better idea of the festivities there. Casey also adds in her personal favourites in the book. 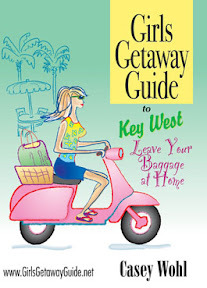 She recommends her selected places to stay, eat and visit while in Key West. I personally haven’t been to Key West or even USA. I definitely would like the opportunity to visit such a place. Hopefully we will have the budget for it in a few years time. I find Casey’s book very informative but it is a tad boring for me as it lacks pictures inside. Being a visual person I love reading travel guides that show pictures of the beaches, hotels and even the different places of attraction. At my site Best Budget Travel Cagayan- I try to add in as many photos as I can about the place like in the promotion of this hotel- Apple Tree Suites with its adventure package. Maybe Casey could consider this in her next Girls Getaway Guide. Do drop by her site for the 12 days of Christmas contest which she is conducting. Looking at this picture of prestine white sand along the coastline is really relaxing. How I wish I could be one of the holiday makers lying under the big umbrellas sipping on a cocktail and enjoy hearing the sound of waves lapping against the beach. Such a dream can become a reality. Yes, it is possible if you are aiming to be a freelance travel writer. Wendy VanHatten has just released a book entittled Travel Writing as a Freelancer and my site is fortunate to be one of the be part of her virtual (blog) book tour. In her 64 page e-book she gives really handy tips on how to get started as a freelance travel writer. She describes in detail the steps in how to write your articles. There are many easy to relate to examples and even milestone checkers in the mini assignments that she gives at the end of each topic. Topics covered in her book include, specializing and specifics,story structure & headlines and using photography to sell your story. The tips and tricks shared by Wendy are very useful for me as it taught me more about how to market travel destinations. For those who do not know besides focusing my energies on this parenting blog I have two travel websites- Best Budget Travel Cebu & Best Budget Travel Cagayan. With the added knowledge gained from Wendy’s book I will be able to come up with some articles to promote these two websites during the current festive season. Do hop over to Wendy’s site to check out her book if your interested to be a freelance travel writer. and tomorrow it will continue with Casey Wohl at Girls Getaway Guide.